Hot on the the heels of yesterday's news that the second Pat Wildman adventure, The Scarlet Jaguar, has just been released in ebook (Kindle - Nook coming soon), comes today's post from Meteor House announcing that the first Pat Wildman book, The Evil in Pemberley House, will be released in an affordable trade paperback edition in August! 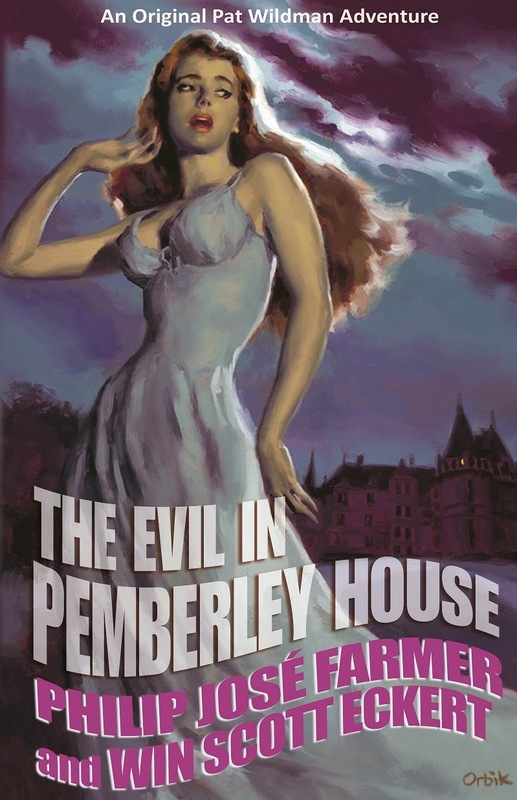 The Evil in Pemberley House, the novel on which I was fortunate enough to collaborate directly with SF Grand Master Philip José Farmer, was published in 2009, just a few short months after his too-soon passing. The trade hardcover retailed for $40, while a numbered hardcover plus chapbook listed for $60. Both editions sold out in 2010. The Evil in Pemberley House is immediately available for preorder direct from Meteor House. Order before June 30th and I will sign your copy when I am at FarmerCon IX/PulpFest 2014 in early August (all books will be shipped after FarmerCon, unless of course you come to FarmerCon, in which case you get your copy in person and Meteor House refund the shipping charge).